The Simufact.forming Sheet Metal Forming application module aids the simulation of forming sheet metal parts from flat rolled primary materials. This module supports the manufacturing processes of tubes, profile parts, structural parts, engine and transmission housings, mechanical components, and many other products. This module supports transfer presses, as well as progressive tools, roll forming, and rolling production processes. The high flexibility of this module allows for the modeling of the most demanding multi-axis tool movements. The innovative and advanced features of this module, with its element and meshing technology, yields precise results while being simple to use. 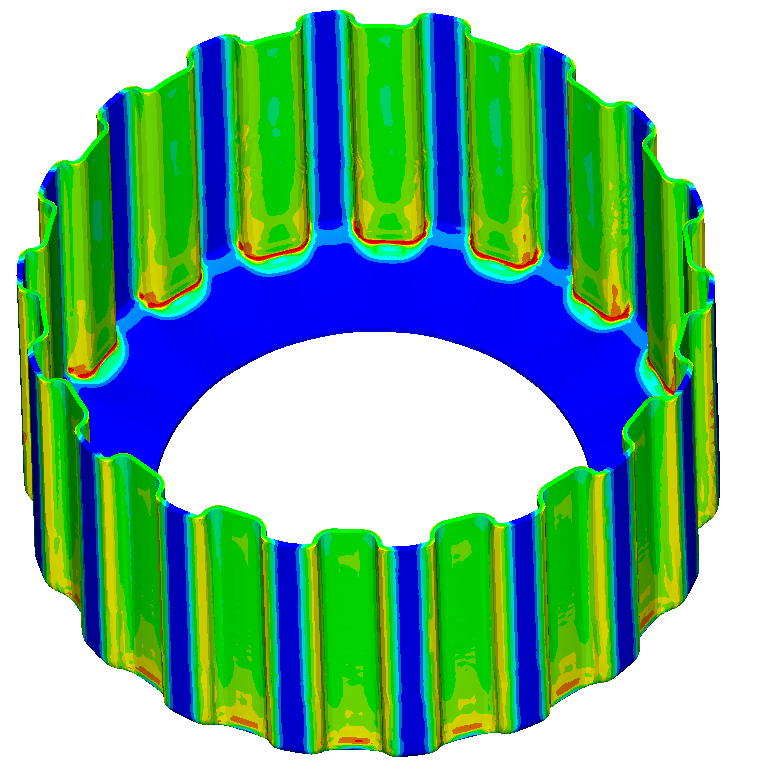 With Simufact Forming, multistage forming processes can be calculated automatically. As well as the actual forming operation, this module can also depict accompanying punching and cutting operations. In addition to the real geometries, the stress and hardening state of the material can be easily transferred to subsequent manufacturing operations, exactly as occurs in a real production process. The Sheet Metal Forming module also allows the combination of different processes with incision tools, transfer tools, or in progressive tool technology for realistic modeling. The integrated material database contains the required material properties of many commercially available steel and aluminum materials to use in this application. A simulation of martensite evolution during press hardening. A simulation of a seam connection between two metal sheets. A large number of users trust in simulation technology from Simufact. Your request will be forwarded to our Global Sales & Support Network that provides best-in-class industry-related application-specific sales and technical services - backed up by qualified local Simufact and Channel Partner experts. Copyright© 2019 simufact engineering gmbh | Part of Hexagon. All Rights reserved.